Uncategorized | Wheat, Not Oats, Dear. The best fireworks display I ever done seen was from the window of an airplane in 2005. I was flying into Chicago late in the evening on the 4th of July, and as I looked outside, I saw that the entire city was ablaze with the fireworks people were setting off in their backyards, in the streets, from the decks of boats, from reconnaissance satellites orbiting the earth [not really]. There were fireworks everywhere, by God; fireworks for glory! When I have related this story before, I have also related that, upon arriving in my neighborhood, I discovered a scene of celebration which resembled the Battle of Shiloh–namely, a scene of smoke-filled air and hoarse cries of victory, except without rifle-mounted bayonets. Hey, who won the Battle of Shiloh, anyway? Hold on, I’m going to go check. 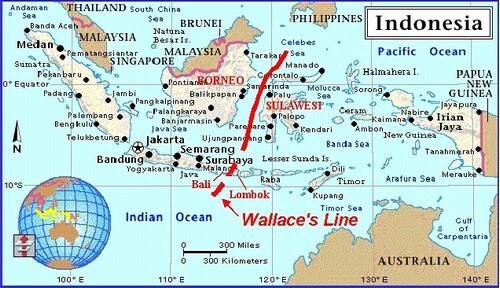 The Wallace Line is named after a man named Alfred Russel Wallace, who discovered [and ’twas no rabbit he pulled out of the hat, gentle readers, but years of work!] a major natural demarcation line between the two areas you see above. They are not that far apart– certainly not so far apart as, say, Africa and the Americas–but their plant and animal life is very different on each side of the line, having thusly developed due to–if I understand correctly–continental drift? The Colombian government released a video of the rescue [two of the agents involved were posing as journalists]. It is blurred, confusing, and one of the most strangely moving things I’ve ever seen. One of the hostages, a man named Raimundo Malagón, had been a captive of the FARC for ten years. He approaches the cameras at one point, “pleading to tell his story to the journalists” [quoth the New York Times; it’s in Spanish]. You can see the guerillas in the background, guns held aloft. The hostages board a helicopter, hands bound, believing that they’re simply being transported to a different location, since their rescuers are pretending to be captors. Ingrid Betancourt and her fellow hostages were marched through the jungle for years, sick with tropical diseases, tortured–they were apparently chained to trees by their necks. This is the short list. One thinks of these things, watching the video: and then they are free. You’ve never seen anything quite like it. I cried my eyes out. It is not the case that Colombia was never on my mind prior to this point. However, it was not on my mind enough. “Colombia: On My Mind Enough, And In Addition I Need To Do Something About It, Volunteerism-Wise, For the Love of God and All His Angels In Heaven” is my new life motto. When I was a freshman in college, I was introduced to the poet Philip Larkin by my roommate. She owned his collected works, which I read as though they were cool, clean water and I was a wayfarer in the Strzelecki Desert. [Thank you, Jessica.] That was the first time I received an inkling that poetry and I were meant to be together forever, or “4-ever”, if you would like to get all technical about it and things. The poem below is the first Philip Larkin poem I ever read. I memorized it, then and there, and have known it for years. Whatever else has come and gone in my memory, poetically-memorizingly, this has stayed. MY MOTHER: How in the hell did we win this war? Back from your mouth to colonise.